Happy Thursday! Isn't this week flying by? Today I'm linking up with Anne in her monthly Pin to Present series (and Amanda for Thinking out Loud!). I usually try out a recipe I found on Pinterest, but today I decided to switch it up a bit and test out some beauty hacks. There are so many tips and tricks out there, and everything promises beautiful results in just minutes. If I can re-vamp my beauty and hair routine and save time, I'm all in! Today I'm testing out four pins- two for hair and two for makeup. Keep reading to see if the pins were a yay or a big fat NAY! The first pin I found promised a 1-minute longer, fuller ponytail. The images made it look simple: just divide your hair in half horizontally and put each into a ponytail. Easy, right? It turns out that this pin works! I loved how the two pony tails made my hair look longer and gave it a nice layered look. Next time I'll try this with curly hair to better disguise the lower ponytail bump. Overall- this was a YAY!! My second pin was for the popular "no heat curls" with a bit of a twist. This involved spinning your hair around a headband before bed while your hair is damp, and waking up with beautiful curls. A bit more time consuming, but a promise for great curls while we sleep is nice! This also worked! The curls were nice and soft, and were surprisingly neat. I expected a big mess and tangles, but it actually looked good! In the morning, all I had to do was take out the band and brush my hair (took all of two minutes). I think it would work even better if I put anti-frizz cream or spray in before wrapping my hair around the band (as you can see my hair is a bit frizzy in the front). Overall- another YAY!! My first makeup hack was intense liner trick . This uses a regular liner, heated for a second, and voila- gel liner! This would help make my regular liner more crisp and allow me to wing out my normal pencil liner! Unfortunately, this was a miss. 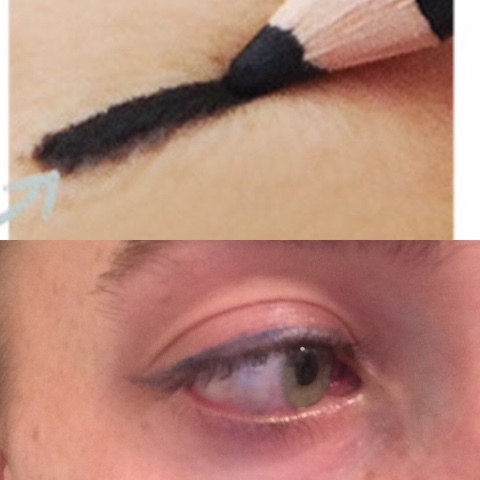 When I tried to apply the liner to my eyes, it crumpled and dried up, and was really sheer. It also completely ruined my pencil, so it's really wasteful! Overall- NAY!! 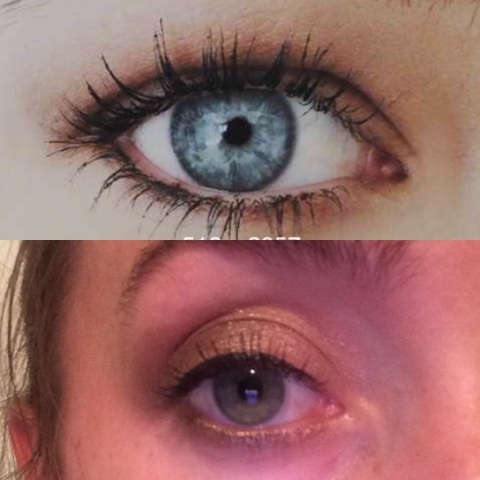 Finally, my last pin promised an easy smokey eye with just one cream pencil. All you have to do is draw a cross hatch on the outer V and blend! This surprisingly worked really well (even if the picture doesn't show it very well). I used my favorite Mally cream shadow and drew out the hatch. Once it was blended, there was a prefect amount of color which darkened toward the outer corner. Really flattering and easy. Overall- YAYYYY!!! Overall, it was a lot of fun to try out new beauty tricks, and I found some new favorites! I will definitely keep playing around with the hair tricks and keep the smokey hack, but will keep buying gel liner if I want to wing out my liner. 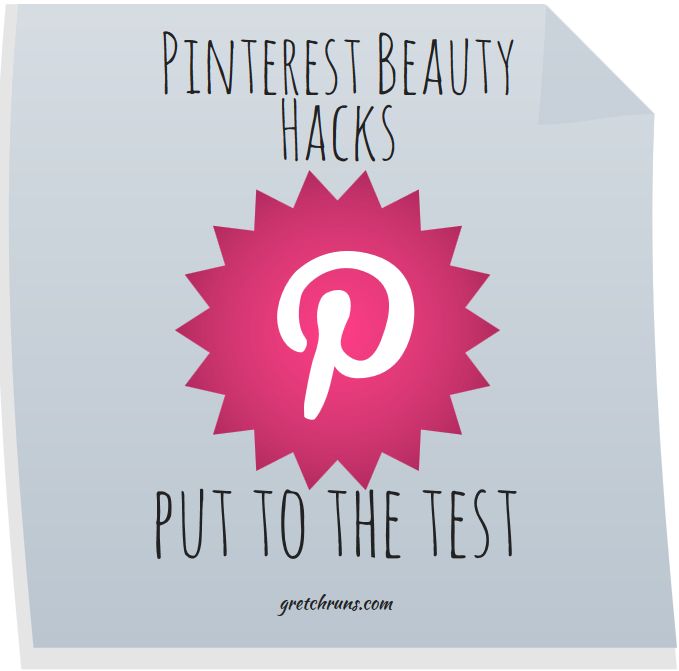 What are some of your favorite beauty hacks? Any epic fail pins you want to share? Nice ponytail! :) I am ruined for all liners but Kat von D's "tattoo liner" in black. I just love it, and it stays all day--I could never do liquid liners before I tried hers. Thanks! I also have the KVD liner and it's amazing! I'm so glad she added more colors and I'll have to pick them up soon. I can finally use liquid liner now...thank goodness!! Thanks for the suggestion! Love these hacks! I'm always looking for fun new tricks. What a fun post! That ponytail looks really great! I would love if I could figure out how to pull off that look for days when I want to wear my hair up but still look nice. Thanks! It's super easy and looked really sleek for work. You should definitely try it! Oh, I love these types of posts. I so desperately need all the help I can get when it comes to being girly. I have huge curly hair but it's unruly in the mornings. I'm going to try that headband thing and see if I can wake up with my hair a bit more calm. Thanks! This is so fun! I'm so bad at pinning stuff and never going back to try it. I think the ponytail is my favorite by far. I'm inspired to actually follow through on some of my pins now! I try to replicate as many pins as possible because I hate just letting them sit! I love the ponytail as well..definitely a hit :) Please share your results!! love the ponytail! I never look at the beauty stuff on pinterest because I am too busy with the recipes (mostly dessert lol) But I really need to check other stuff out! Thank you! I'm in love with all the recipes as well..so many good looking food! I know I'll be all over the DIY stuff as well once I get a house :) Pinterest is the best! I'm in desperate need of a bun hack... my buns are either messy or... messy. Love the thicker ponytail. You are so open to trying new things. I like both hair ideas. This is the longest my hair has ever been, long enough that I'm thinking about starting to play with some styles instead of just wearing it straight like i usually do. I might try the curls at night one. Thanks! Ohh that's so exciting!! I've only had long hair but I'm so lazy with it and never style it. I hope that works out for you!! Every time I try the double pony tail I get so nervous that it will show and look strange! Plus I'll check on it with my hands and realize the top pony has gone all to one side and so it's really obvious that it's two separate pony tails haha. Maybe curly hair would make the difference! I might have to give that beauty trick another try. I know exactly what you mean!! I think what worked for me was making the top ponytail pretty large and take hair right at your ears. That way it can cover the bottom pony better. Hopefully that made sense! I've seen that thicker ponytail idea - glad to see it worked for you! Definitely trying it again..it's great! I'm so impressed with the hair ones - I never believe those overnight curls would actually work, but yours look great!